Most Latinos living withing the District are new comers, younger immigrants. The usual trend is shaped for the fact that traditionally Washington, DC, has been a safe place for immigrants to live, work and commute. Once the immigrants settle down and start making more money (or get their legal residence and citizenship in process) we tend move to fancier, most established neighborhood in the suburbs of MD and VA. In recent years though, the increasing gentrification of DC, has pushed immigrants to move away to cheaper areas within the District and the suburbs, mostly in Ward 7 and PG County, because of lower rental fees and properties prices. Also, many Latinos with children prefer moving to Northern VA, Montgomery County because of the quality of their public schools, job opportunities, and because their relatives live there already. The case of Ward 1 is peculiar, because it's been one of the oldest traditional areas for immigrants. But life costs has gotten so expensive in that area that many Latinos (including myself) have moved away. 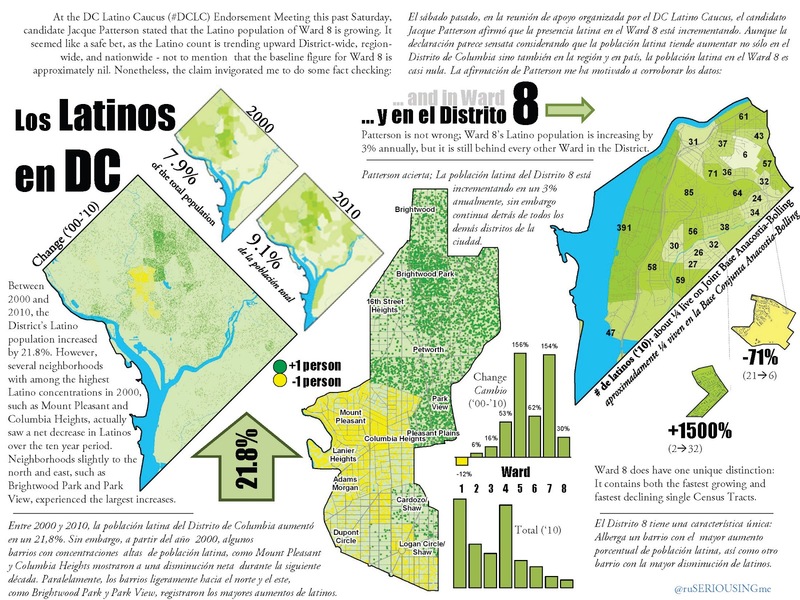 In Ward 8, the issue of urban violence, lack of good public transportation and cultural misconceptions keep Latinos from moving there yet. 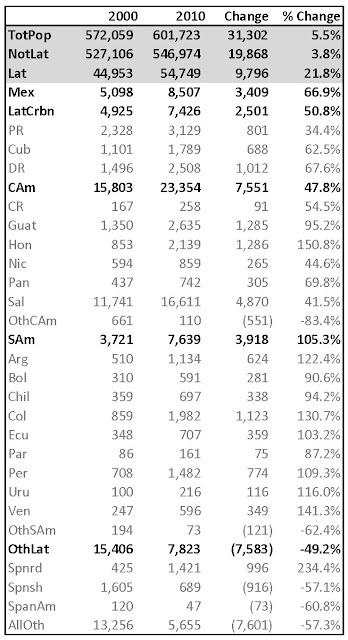 If more Latinos will come to DC in the future, is hard to know. I see more Brown families but I think the suburbs will remain as their favorite residence areas. This is a good report, thank you for posting. Just two observations here. The first is that we believe there is a serious undercount of Latinos in DC by as much as 20-30%. 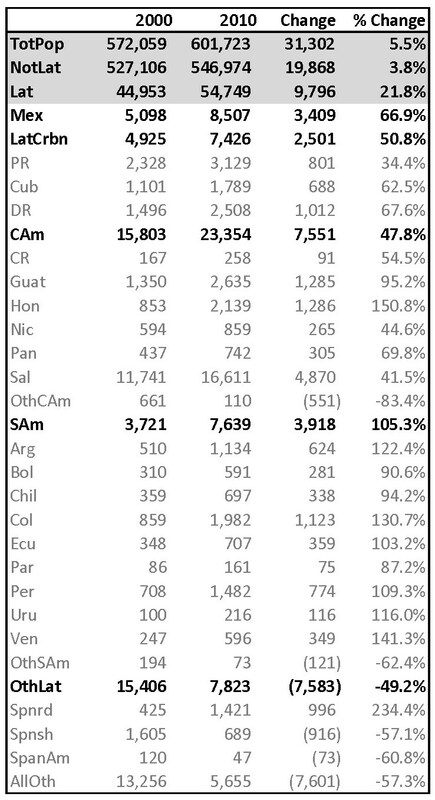 The real count is closer to 70K or about 12% of the total population. Spain is going through a serious recession and net emigration from that country has risen exponentially and some of that spill over has landed here in this region. Mostly young folks on student visas or seeking jobs at international agencies, etc. The embassy has commented on this trend. 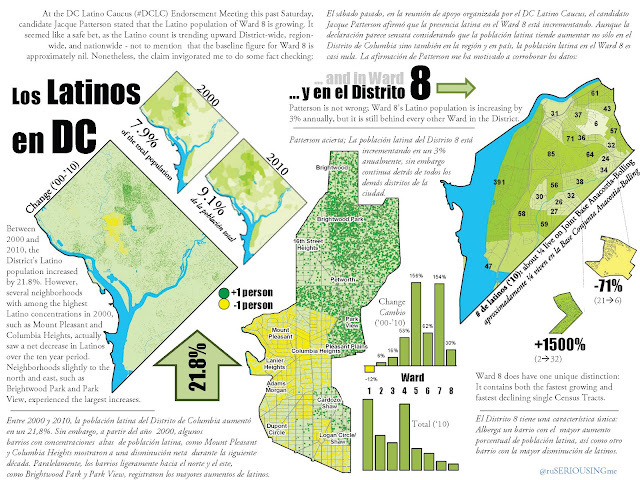 The analysis of Ward 5's Latino population is worthy of the heightened attention you'd give Ward 7. If you look at the geographic pattern of the growth of this population, you can see that there is some spill-over from adjacent areas of Ward 4, but there is also a LOT of growth in the parts of the ward with the lowest housing prices (Trinidad and Carver Langston). These ares aren't adjacent to the neighborhoods to the north and west whatsoever. It's definitely the price of real estate and proximity to the heart of the city that makes these neighborhoods attractive to everyone, not just Latinos. Good points, thanks for the feedback. Ward 7 caught my attention precisely because it is not as proximate to the heart of the city as other growing neighborhoods, including Trinidad (though I suppose that depending on distance to metro, it could be closer time-wise). Wards 7 and 8 are similar in terms of distance and housing costs, so I wondered why Ward 7 but not 8. In Ward 5, the growth along Rhode Island Ave impressed me the most. Honduras has the world's highest murder rate and went through a period of instability following the coup that overthrew the elected presdident in 2009. Venezuela is also suffering extremely high crime (Caracas may have highest murder rate of any capital city in the world) in addition to political turmoil.